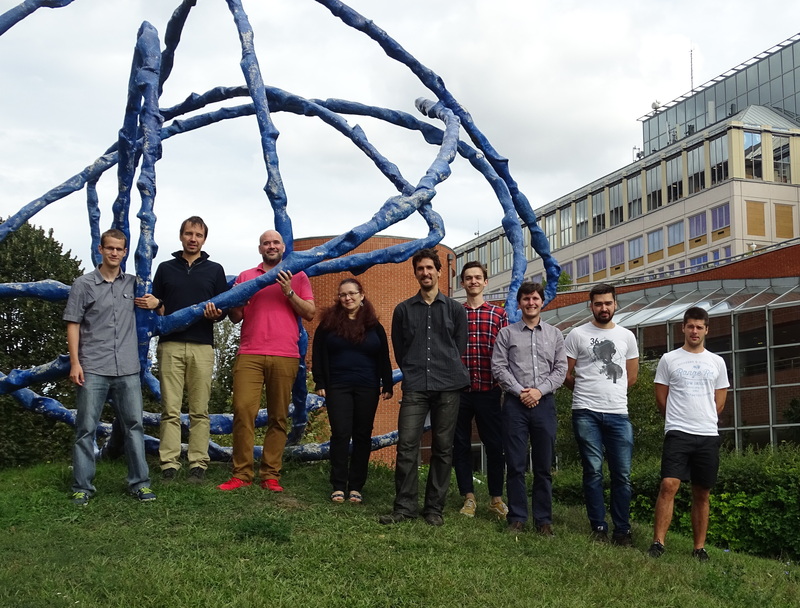 "The MTA-ELTE Lendület CMS Particle and Nuclear Physics Group at the ELTE Campus in front of the modern statue "Semi-empirical atom" that illustrates an electron moving around a nuclei." We work in the forefront of high-energy physics research within the large international CMS collaboration at the Large Hadron Collider (LHC) at CERN. We study the Standard Model (SM) of particle physics, in particular its electroweak sector, and search for new phenomena that can lead us to the fundamental theory that lies behind the SM. We also investigate the strong interaction in extreme conditions and aim to characterize the hot, dense matter, the quark-gluon plasma (QGP) that existed shortly after the Big Bang. The LHC, accelerating proton (p) and lead-ion (Pb) beams, provides a unique opportunity at the energy frontier. Its Run 1 data brought ground-breaking results, starting in 2010 with the first direct observation of centrality-dependent jet asymmetry due to jet-quenching in the QGP. The discovery of the Higgs boson in 2012 has then crowned decades of research to complete the SM and to explain how the mass of elementary particles is generated. These discoveries set the stage for LHC Run 2 that started in 2015. The increased energy (13 TeV for p-p collisions) and the expected data statistics (~10 times that of Run1) opens new territories. We test the SM via precision measurements and search directly for new physics suggested by theoretical arguments and observational hints, such as the lack of a consistent theory of quantum gravity, the naturalness problem and the existence of dark matter and dark energy. The CMS data will also allow a more in-depth study of many facets of quantum chromodynamics (QCD), including the properties of the QGP whose description is one of the most important open questions in QCD today.